I love hearing stories about how folks are getting out of debt – and living debt free! Several years ago, my wife and I paid off all of our consumer debt – and we are now in the process of paying off our mortgage. I created an illustrated guide for debt reduction – t0 show the process that we used to eliminate our debt. 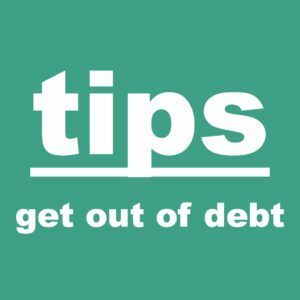 Here are few quick tips which have helped us reduce – and eliminate – our debt. 1. We make plans – and stick to them. Here’s our simple, one-page plan for eliminating our debt. Day after day, month after month, and even year after year, we keep plugging along. 2. We make all minimum payments – and then we make multiple, principal-only payments, throughout the month. These micro-payments keep us “in the game” and involved in our finances, daily. 3. We make our minimum payments as soon as possible. This reduces our average daily balances, thereby reducing interest charges. 4. We apply any extra income (including refunds, gifts, or bonuses) towards our debts. 5. We search for ways to reduce interest rates – including transferring balances from higher-rate cards to lower-rate cards – and refinancing our mortgage. 6. We look for ways to shift money from our “spend” categories into our “debt reduction” category. I’ll call all of our service providers (cell phone, satellite, internet, etc.) and ask for discounts – and I’m constantly looking for ways to reduce monthly spending (via coupons, bargains, sales, or bartering.) Any money saved can then be allocated towards debt reduction. 7. We remind ourselves of our long-term goals – We want to be completely debt-free, own our on home, and enjoy retirement. We are working towards these goals – and feel confident that we will achieve them. Thanks for checking out No Credit Needed. Please subscribe to No Credit Needed via daily email or rss – and follow me via Twitter and Facebook – for future content. Blessings.